The state of Illinois has strict provisions on tenant’s security deposit and if the landlord fails to oblige by these laws, there are legal consequences if the matter ends up in court. If the landlord ignores a security deposit request from the tenant, then this Demand letter should serve as a strong warning against their willful violations. The landlord’s failure to repay the security deposit or provide an itemized list of deductions within 30 to 45 days after the tenant leaves the rented property, the tenant can sue them in court. The only legal deductions that can be made on the deposit includes unpaid rent, substantial damages beyond typical wear and tear on the property and those resulting from breach of lease agreement. Although settling the matter in court is an option, it can take some time. A speedier and smoother way of settling the matter and getting back the owed security deposit is by sending a professionally written Security Demand Letter that clearly highlights your demands as a tenant and also warns the landlord on the legal liability for defaulting to pay the security deposit as required by Illinois landlord-tenant laws. This letter is a reflection of the Illinois state laws and acts as the final warning to the landlord for their negligence and failing to abide by the civil code. Sending a security demand letter usually prompts the landlord to send back the owed security deposit fast without the need to go to court. To avoid any future conflicts, always make sure to put in writing any correspondence with the landlord. Send this letter through certified mail and save your own copy. 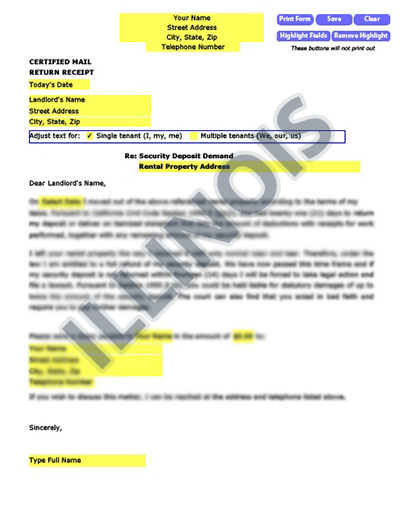 Our letters for Illinois renters are tailored to your state, with the right laws to get your landlord’s attention. We’ve taken care of the Security Demand details so there’s no hassle on your part to find the right law and craft an approrpriate letter. Our letters have been used in Illinois and all over America with great success.